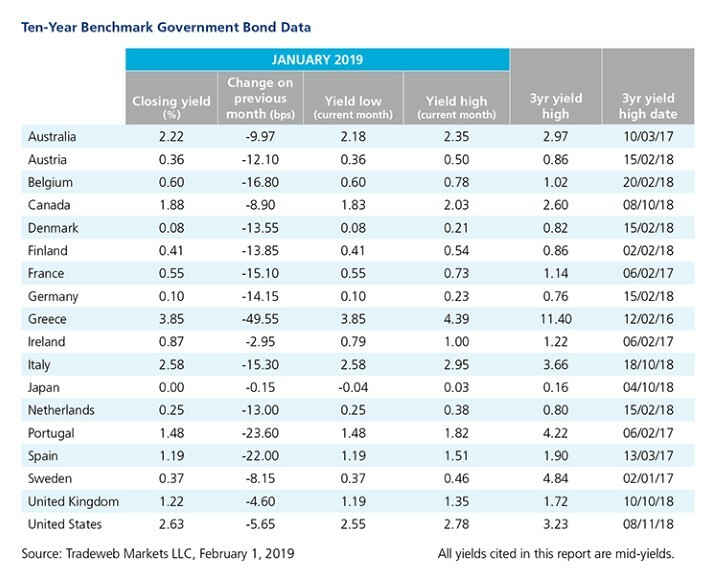 The New Year began like the previous one ended: 10-year government bonds rallied, with many of the securities tracked in the table below showing double-digit declines in mid-yields over the course of the month. The Greek 10-year government bond yield led the way, tumbling by nearly 50 basis points to close January at 3.85% amid notable political and economic events. Prime Minister Alexis Tsipras won a no-confidence vote to hold his governing coalition together. What’s more, the country finally issued new debt at the end of the month, following August’s exit from the bailout package. The bond sale raised €2.5 billion. Meanwhile, yields on Portuguese and Spanish 10-year debt dropped by 24 and 22 basis points to end the month at 1.48% and 1.19%, respectively. Portugal completed one quarter of its target of €15.4 billion in total bond sales for 2019, selling €4 billion of bonds. The country also posted its biggest budget surplus since the adoption of the Euro. Spain sold a record €47 billion in 10-year debt, as 2018 GDP reports came in showing a slowdown to 2.5% compared to 3% in 2017. Similarly, Italy’s 10-year benchmark yield dipped 15 basis points to 2.58% at month end. The country issued €10 billion in debt and received orders from investors for as much as €35 billion, amid ongoing political uncertainty. On January 24, the ECB left rates unchanged and stated that they will remain at current levels at least through summer. Ending at a month low of 0.10%, 10-year Bund yields declined by 14 basis points during January. Federal Statistics Office data showed the German economy grew by only 1.5% last year, the slowest pace in five years. In the U.S., movement in the 10-year Treasury yield was less pronounced, falling by 6 basis points to close at 2.63% on January 31. An initial release for employment growth showed a gain of 312,000 jobs, while the Federal Reserve left the range for the federal funds rate unchanged. In the Asia-Pacific region, the yield on the Japanese 10-year note decreased by 0.15 basis points to 0%, as the Bank of Japan maintained its 0% 10-year yield policy.